The International Science Council (ISC) is an international non-governmantal umbrella organization, encompassing both natural and social sciences. ISC was founded in 2018, after the merger of the International Council for Science (ICSU) with the International Social Science Council (ISSC), and is the largest organization of its type in the world. The membership of ISC currently consists of about 40 international scientific Unions and Associations (IUTAM being one of them) and 140 national and regional scientific organizations, including Academies of Sciences and Research Councils. The inaugural meeting of the General Assembly of ISC was held in Paris on 3-5 July 2018. 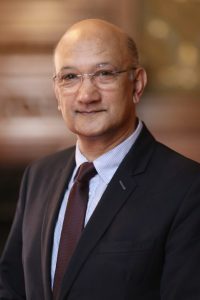 During the meeting, the governing bodies of the Council were elected, with Professor Daya Reddy (in the photo) becoming the first President of the Council. Professor Reddy holds the South African Research Chair in Computational Mechanics at the University of Cape Town, South Africa. His research interests center around mathematical methods in mechanics, including modelling, analysis and simulation. Among his scientific contributions are significant advancements in the field of complex material behaviour and the methods of computational approximation. He is also actively involved in biomechanics, with cardiovascular mechanics as one of the research topics. The mechanics community represented by IUTAM congratulates Professor Reddy on having assumed the prestigious position of the President of ISC.